“Age cannot wither her; nor custom stale her infinite variety…” – William Shakespeare, ‘Antony & Cleopatra’Whether Shakespeare’s Globe Theatre, the Paris Opera House, or the ultra-modern Kodak Theater located in the heart of Hollywood, societies past and present have always felt a certain love for majestic theaters. During Hollywood’s golden era of the 1920s and 1930s, thousands of stunningly ornate movie palaces were built across the country in towns and cities both big and small. It was here, behind massive velvet curtains and beneath elaborately decorated walls and ceilings, that Americans first began to fall in love with movies. 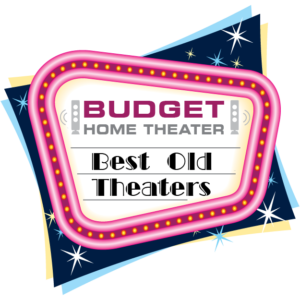 Most of these majestic old theaters have been torn down over the years to make room for stores, housing, and bigger chain theaters. Fortunately, some of these old movie palaces have survived to find new life as digital cinemas, performing arts centers, and even churches. 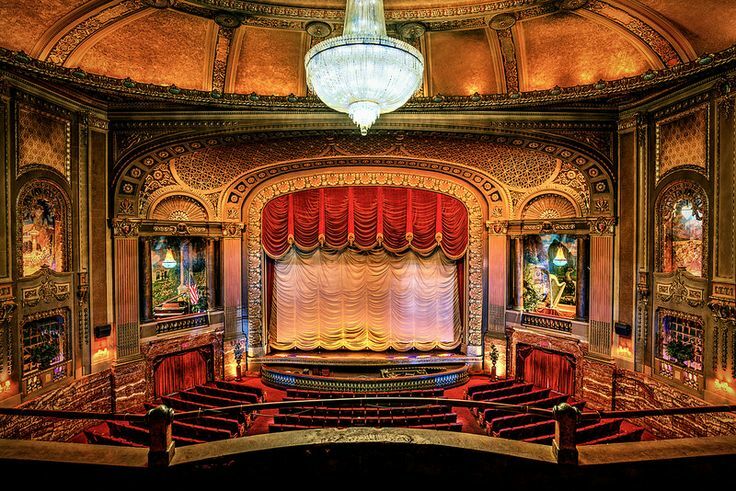 We went on a hunt for the most majestic old theaters still in existence, and found these scattered all across the U.S.: 50 towns with the most majestic old theaters. 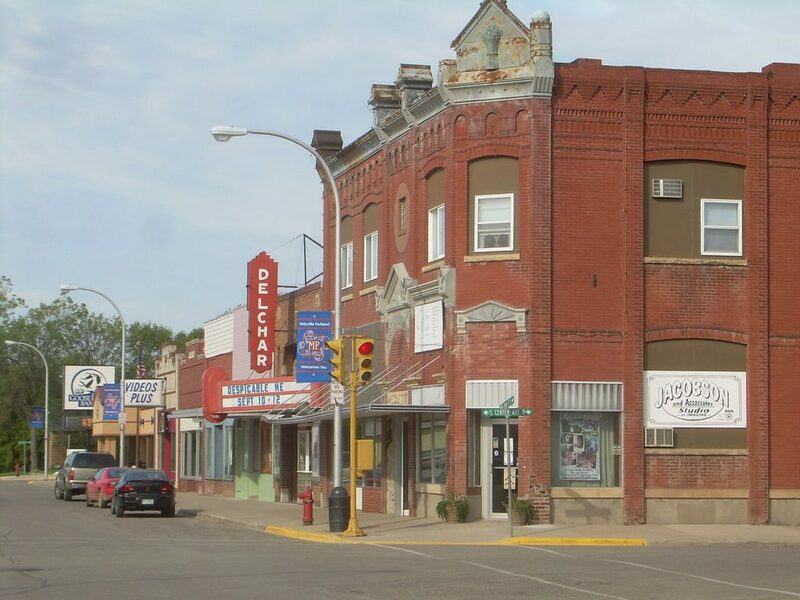 Located “one block north of the stoplight” in Aitkin, Minnesota, the majestic Rialto Theatre has offered a form of entertainment and escape in this small town for more than a century! Built back when “talkies” were just becoming popular, this movie palace was originally constructed with a “smoke room” for men, a “powder room” for women, and even a “crying room” so that families with young children could watch a movie without disturbing the rest of the audience. 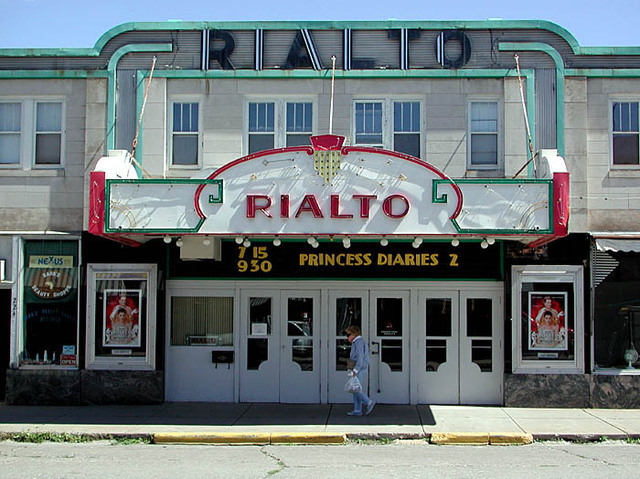 Besides a new screen and concession stand, not much of the Rialto has changed over the years. It still plays movies in film format, and the Art Deco interior remains as grand as ever. 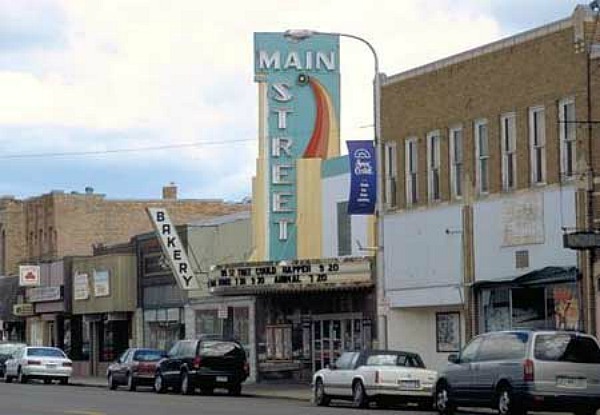 Many of the majestic old theaters on this list were built in the grand Nuevo (Art) Deco style that was so popular among movie palaces, but Anaconda, Montana’s Washoe Theater has the unique distinction of being the very last theater constructed in this style — a feat that earned it a spot on the U.S. National Register of Historic Places. The theater, finished in 1931, boasts exterior doors of etched glass, complicated relief patterns on nearly every joint and trim, and a domed ceiling with a mural painted by Colville Smythe. The theater’s original painted silk curtains also remain, though mostly because curators are fearful that removing them, even for restoration, could cause them to disintegrate. Amazingly, the stunning Washoe Theater still remains in use as a movie theater today. 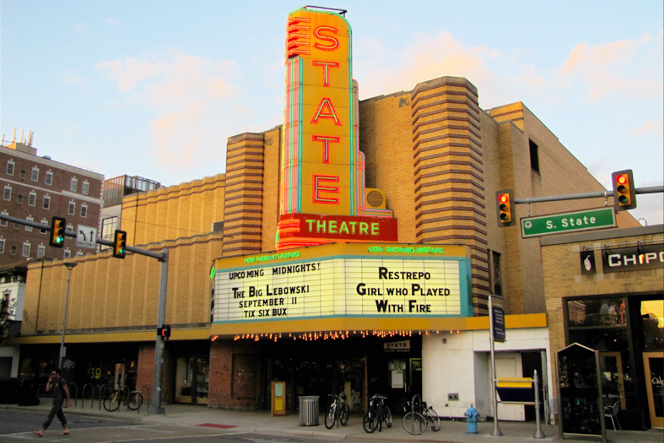 With its grand facade and multi-colored marquee, the historic State Theatre has long been the centerpiece of Ann Arbor, Michigan’s fun, college-centric downtown. Designed and built in 1942 by the same architect who designed Detroit’s Fox Theatre, State originally consisted of a massive single screen with seating on both the main floor and balcony. When the theater changed ownership in the early 1980s, the screen was “quaded” into four separate screening spaces. Despite these changes, the State Theater remains one of the most majestic old theaters still in operation. The theater specializes in “indie” films, and also puts on a popular Midnight Movie series during which it shows cult classics. 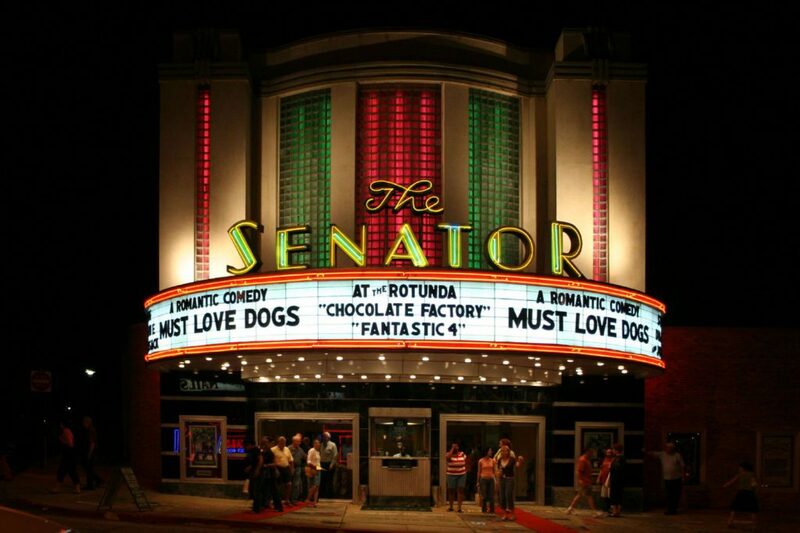 Baltimore, Maryland is home to the Senator Theatre, a stunning movie palace that was opened in 1939. This beloved landmark boasts a number of stunning Art Deco-style architectural details, including original terrazzo floors in the lobby, performing arts-themed murals, a massive gold curtain that still opens before the start of each movie, and skybox-style balconies for private parties. The theater has been named a Baltimore City Landmark and was also given a spot on the National Register of Historic Places. 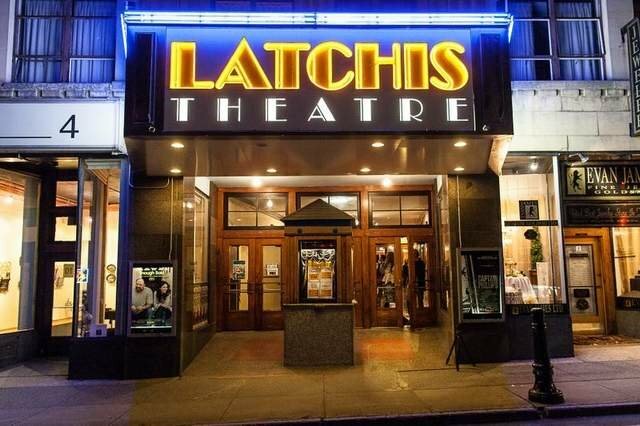 The Latchis Theatre in Brattleboro, Vermont is a part of the historic Latchis building, which also contains a hotel and retail spaces. Opened in 1938, this lovely atmospheric theater is one of only two Art Deco-style buildings left in the entire state of Vermont. Though much of the theater’s majesty has fortunately been maintained, it has been renovated into four screens, on which are shown the latest releases. 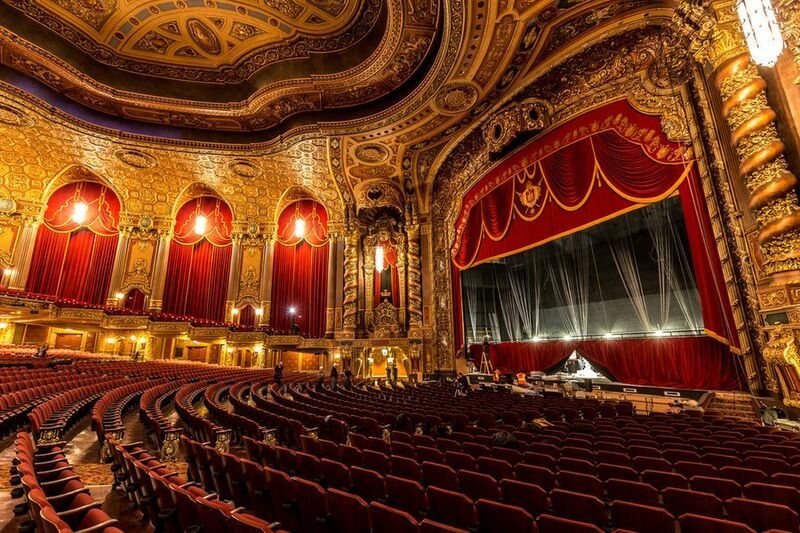 As one of the five boroughs of New York City, Brooklyn is home to a respectable number of historic theaters, the most majestic of which is Kings Theatre. Opened as Loew’s Kings Theatre in 1929, the Kings has hosted everything from vaudeville and other live stage shows, to films. The theater was closed down in 1979, at which point its interior began to deteriorate. 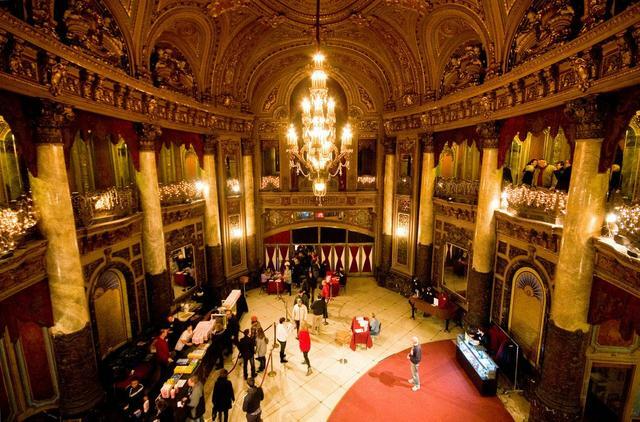 Fortunately, after 30 years and its own documentary, the Kings Theatre underwent an incredible $95 million restoration. Today, the Kings’s interior is as majestic as it once was, and Diana Ross even performed at its 2015 gala reopening. 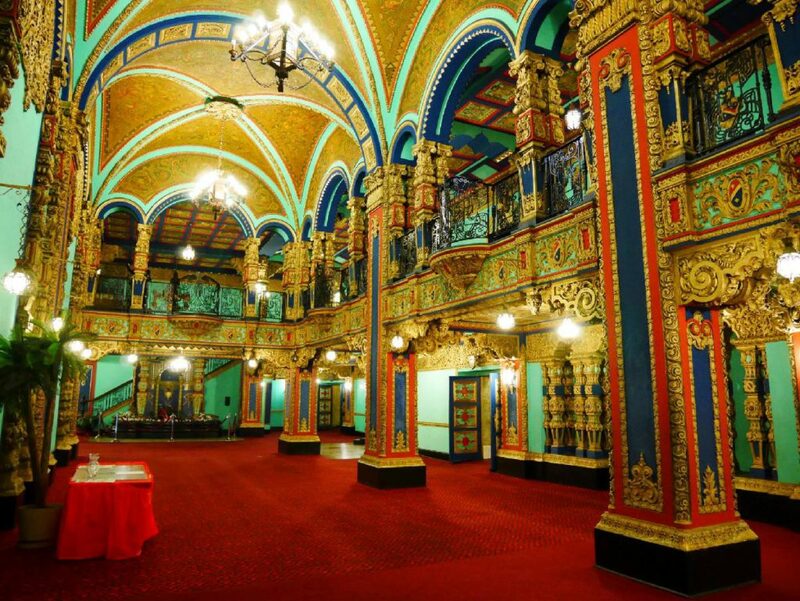 This stunning theater is indeed fit for a king! Though mere traces of its former glory days remain, “the finest playhouse between Portland and Seattle” is still a major fixture of downtown Centralia, Washington. The Fox Theatre opened in 1930, and showed vaudeville, Fox Movietone newsreels, and first-run films. In the years since, the Fox was converted to a multi-screen movieplex, then closed altogether. 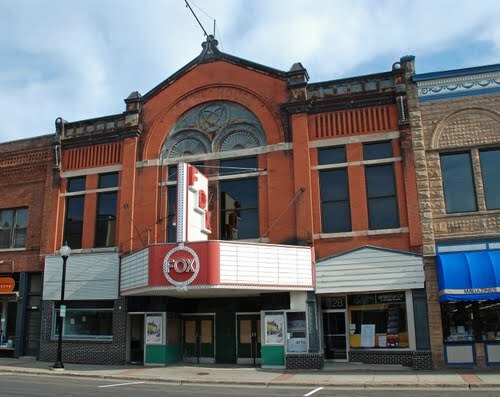 Fortunately, the city of Centralia has long cherished this majestic historic theater, and purchased the Fox in 2000. Much of the theater’s unique exterior, including its marquee, has been restored, while the city has placed mandates on the ways that the renovated space can be used in order to protect its historical significance. Charlottesville, Virginia’s unique, Colonial-esque theater, The Paramount, was opened by Rapp and Rapp way back in 1931. Originally used as a movie theater, The Paramount showed films until it closed in 1974. Fortunately, members of the Charlottesville community recognized the importance of saving this majestic historic theater, so they bought it! 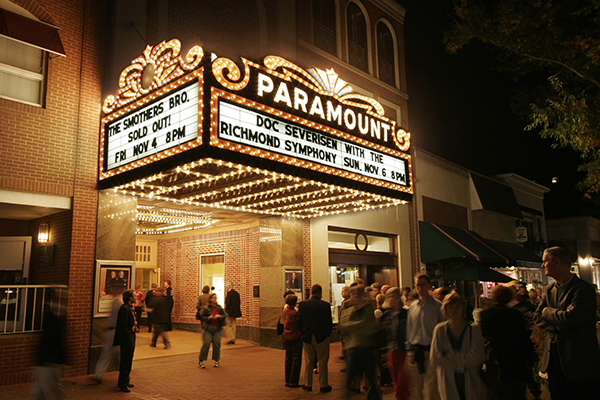 After 14 years spent fundraising, renovating, and expanding, The Paramount reopened as a non-profit performing arts venue in 2004. 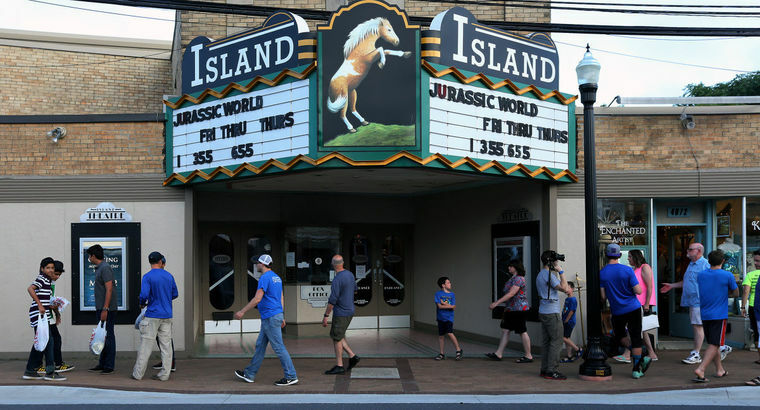 The Island Roxy Theatre is the only movie theater left on Chincoteague Island, a status which fortunately keeps this majestic historic theater popular and protected. It was built in 1945 in the traditional Art Deco style. The theater’s interior remains just as impressive as it’s always been, and still includes the fabric-covered walls in the auditoriums and the original green and pink terrazzo in the lobby. Fun fact: In the concrete just outside, one can find the hoof prints of Misty, the Chincoteague pony made famous in books and film. In fact, at Misty of Chincoteague’s movie premiere in 1961, the pony that starred in the film even walked down the aisles of the theater before the showing. Right after World War II, two brothers-in-law took on the task of constructing the Clayton Theatre in their hometown of Dagsboro, Delaware. As the town’s only movie theater, the Clayton enjoyed an instant success that has hardly waned over the years. 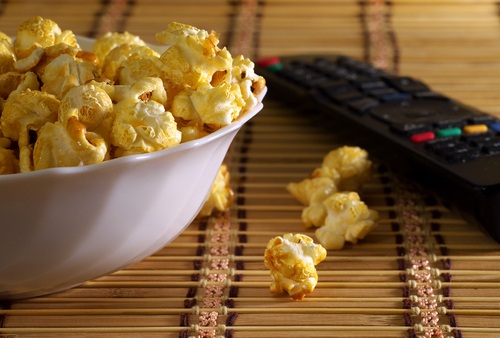 In fact, its local customer base is so loyal that in 2014, when Hollywood declared that theaters needed to “go digital or go dark,” the local community chipped in to outfit their favorite theater with new digital equipment. Besides being a majestic historic theater, the Clayton is also the last remaining first-run, single-screen theater in Delaware. Doylestown, Pennsylvania has a long history of old movie theaters. When the majestic historic theater, Old County Theater, opened in 1938, it replaced two separate earlier theaters! 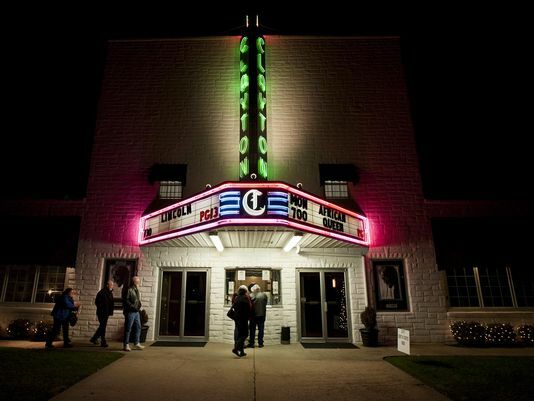 Since then, Old County Theater has been a significant gathering place for locals. The theater has undergone a number of renovations and restorations over the years, though fortunately, much of its original Art Deco-style architecture has been protected, including the exterior’s marquee and neon tower. 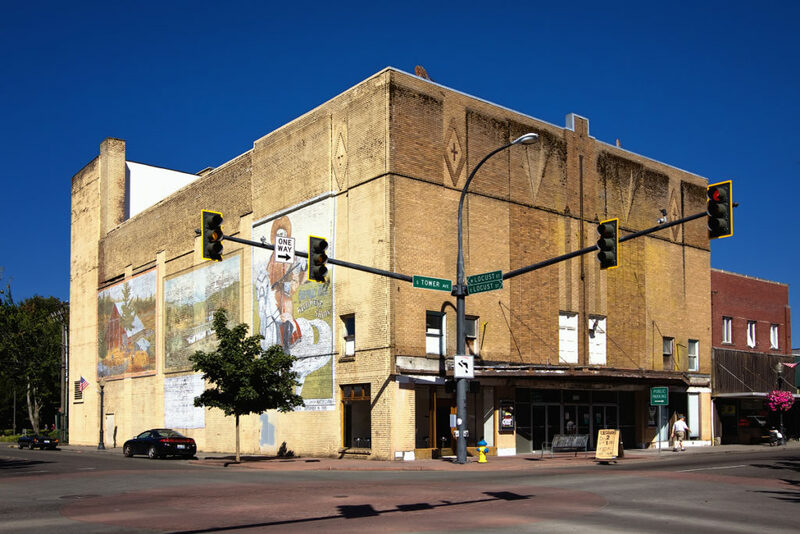 For a town with a population of fewer than 20,000 people, Ellensburg, Washington sure has some majestic old theaters, though unfortunately, none of them are actually being used as theaters today. The Liberty Theater, which opened in 1940, was once a grand movie palace with a showy aqua and white exterior. 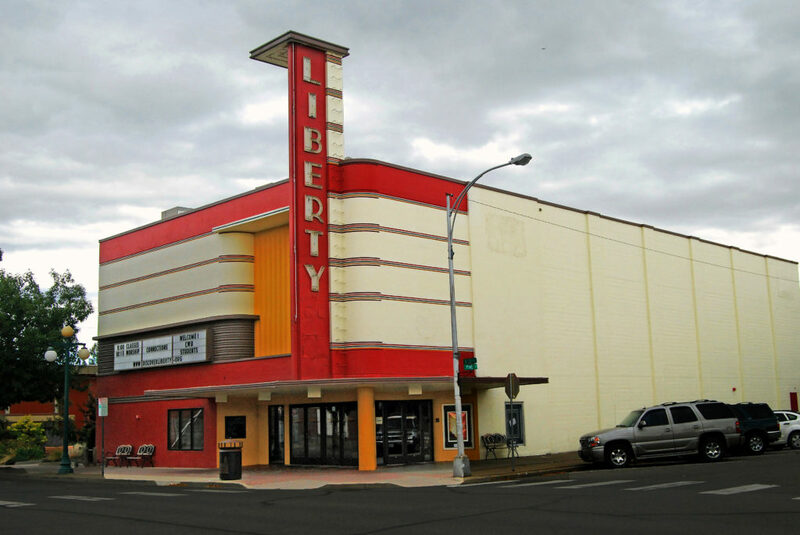 In 2010, the Liberty was painted beige and converted into a church (though the “Liberty” marquee remains). An even older theater was the Audion Theater, opened in 1913 as the Orpheus Theater. Despite its initial success, the Audion became retail space sometime during the 1980s. Finally, the Grand Central Theatre (once known as the Pix Theatre) was the Moderne-style movie house that specialized in those films with R, M, and even X ratings. But even Grand Central was closed down in 2005. So where do movie lovers of Ellensburg go to see the newest flicks? That would be the nine-screen Grand Meridian Cinema, which is pretty majestic too, if not very historic. 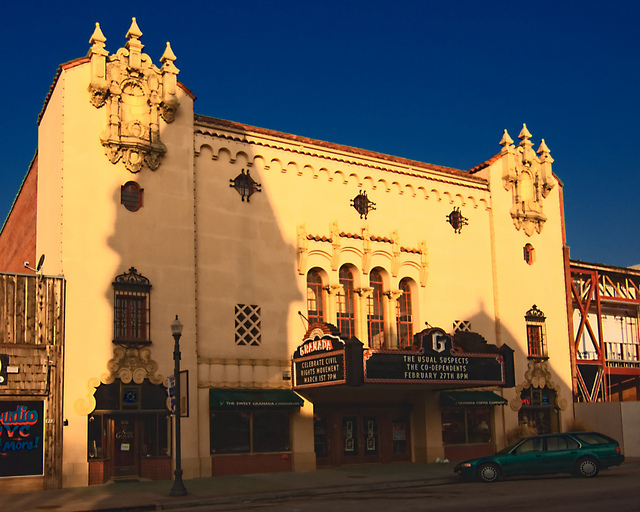 When it was built in 1929, Emporia’s Granada Theatre was the largest movie palace in all of Kansas! In addition to showing the most popular films of the day, the Granada hosted everything from traveling vaudeville acts to beauty contests. This majestic historic theater features a gorgeous, Spanish Colonial Revival-style exterior, complete with ornate terra cotta details (can you spot the five terra cotta clowns?). Over the years, its popularity has waned, though the threat of demolition in 1994 spurred a group of Emporia locals to step in and save the theater from destruction. 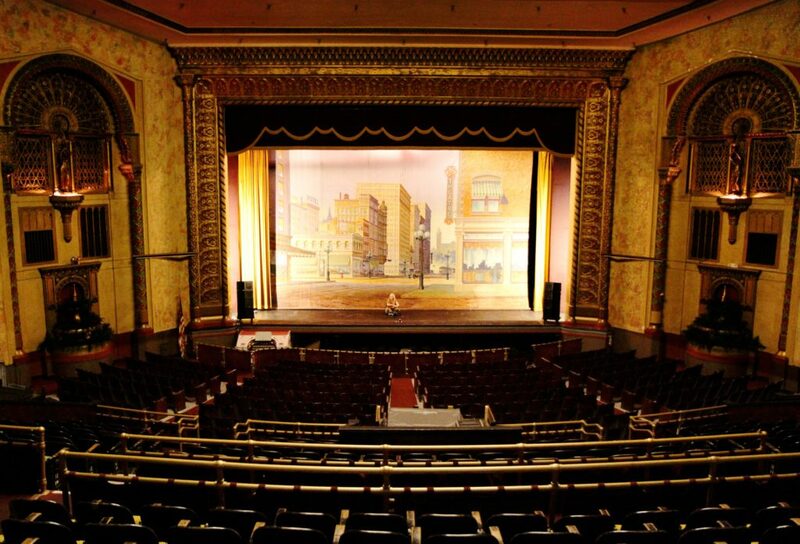 Today, the Granada is listed on the National Register of Historic Places, and is used mostly for live performances. Everett, Washington has had a number of theaters over the years, but the Historic Everett Theatre has been the largest since the day it opened its doors in 1901. The Everett Theatre has gone full circle over the years, beginning as an opera house for opera and vaudeville acts, then transitioning to films in the teens. Some of the most famous names in entertainment graced the stage of the Everett during these years, including Lillian Russell, Al Jolson, Eddie Foy and the Seven Little Foys, and George M. Cohan. Today, the Historic Everett Theatre has transitioned back into a performing arts venue that shows classic and contemporary plays and musicals. Interestingly, this majestic old theater is the oldest operating theater in the entire state of Washington. 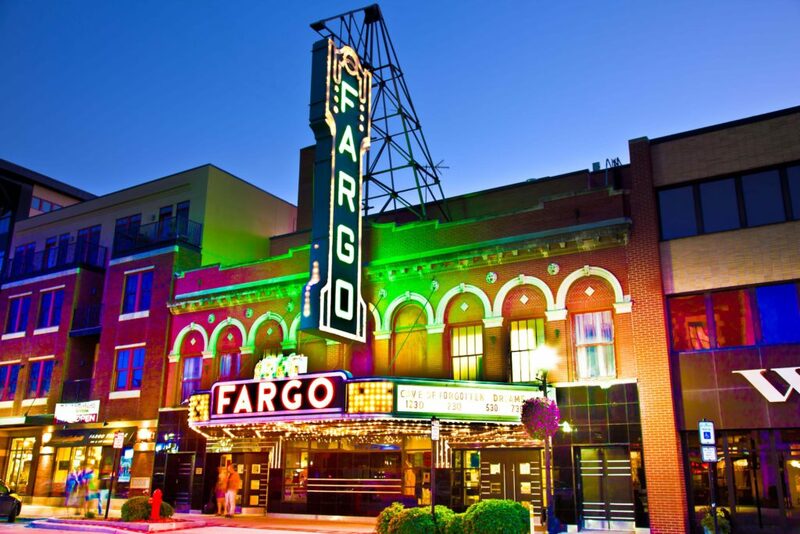 Fargo, North Dakota is home to the Fargo Theatre, a beautifully restored and majestic old theater. The Fargo Theatre was built in 1926 in the Art Deco architectural style. Its beautiful facade is characterized by its stunning light-up marquee and tower, while the interior includes an inverted dome ceiling, ornate stage, and lots of color. Today the theater, which has been placed on the National Register of Historic Places and is run by a non-profit organization, is used as an art house theater for independent and foreign films, plus concerts and other live events. The beauty of Fort Wayne’s Embassy Theatre doesn’t end at the stunning sandstone exterior. The interior boasts an ornate ceiling lobby of terra-cotta, Italian mosaic floors, and various molded plaster embellishments throughout. The theatre originally opened in 1928 as the Emboyd Movie Palace, and included seven stories and 250 rooms to house guests and vaudeville performers. Sold and renovated mid-century, the Embassy is today home to the Fort Wayne Philharmonic. 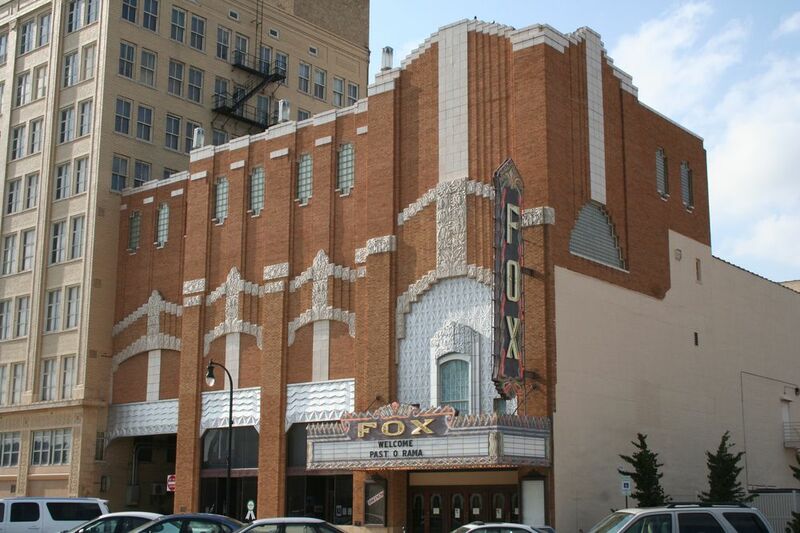 Originally opened in 1931, the Fox Theater in Hutchinson, Kansas is one of the best surviving Foxes in the nation. 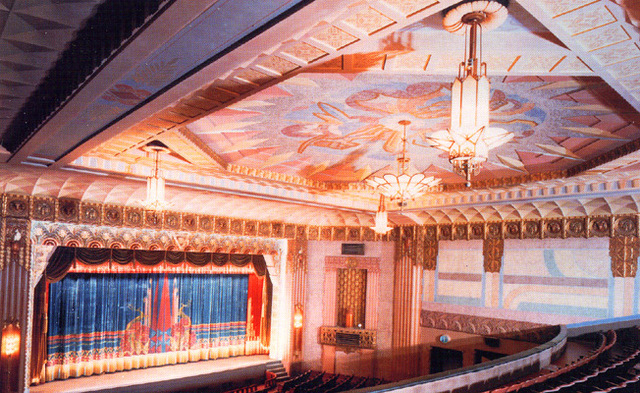 Listed on the National Register of Historic Places, the theater was carefully restored as recently as 1999. Much of the Art Deco character of the building was lovingly protected, including such signature features as the flashing neon marquee, various terra cotta reliefs, ornate door moldings, cartouches, friezes, pilasters, and stepped treatments. Today, the theater hosts various film, theater, symphony, and musical events. The first of five Loew’s Wonder Theatres, Jamaica’s Loew’s Valencia Theatre first opened in 1929 for vaudeville and films. This majestic old theater’s interior is designed in the colorful Spanish Colonial and pre-Columbian styles — quite unique for a New York-based theater. Statues, parapets, and asymmetrical towers adorn the auditorium, while outside brick and terra cotta combine for a Spanish and Mexican-style facade. In 1977, the theater was donated to The Tabernacle of Prayer for All People, which restored the Valencia and continues to maintain it today. 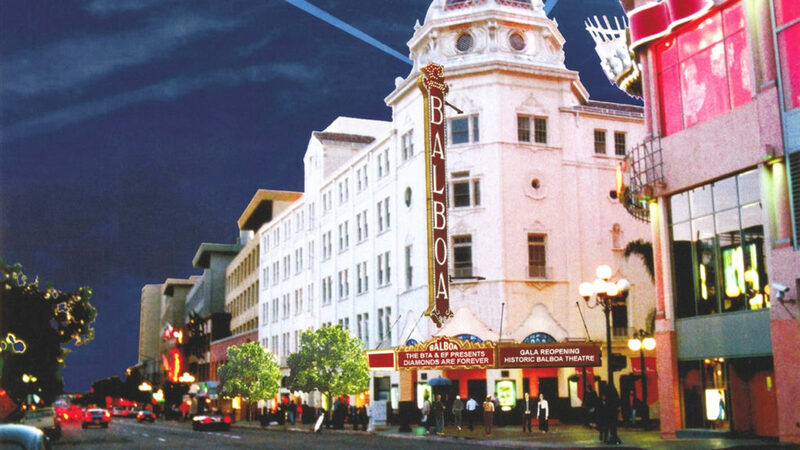 Interestingly, the Valencia’s original Robert Morton ‘Wonder’ organ was restored and moved to another majestic old theater on this list, San Diego’s Balboa Theatre. Another of the original five Leow’s Wonder Theatres is the Jersey Theatre of Jersey City, NJ. Also opened in 1929, the Jersey was designed in the luxurious and majestic Baroque and Rococo architecture styles. Fortunately, this majestic historic theater has remained a theatre for most of its history. Though it went dark in 1986, the city of Jersey City purchased the Jersey Theatre for the Friends of the Loews organization. Today, the theatre is used as a performing arts center and shows revival and art house films. Livermore, California’s majestic little theater, Vine Cinema & Alehouse, was California’s most modern theater when it opened on December 26, 1956. 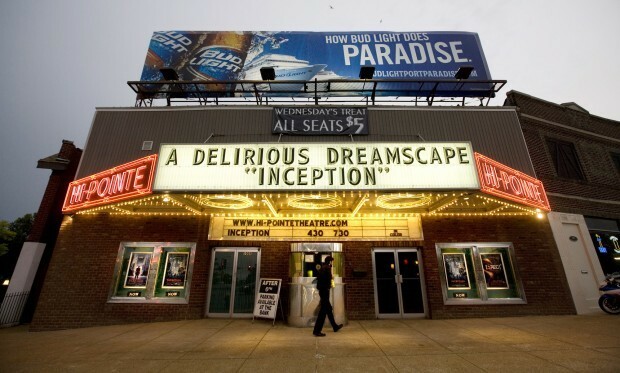 Despite having only one screen, the Vine was the first theater in the state to feature Cinemascope, Vista-Vision, Superscope, and “Directional Sound.” The Vine has been remodeled a few times throughout its existence, most notably in order to expand its lobby, add another screen, and even an alehouse and restaurant. 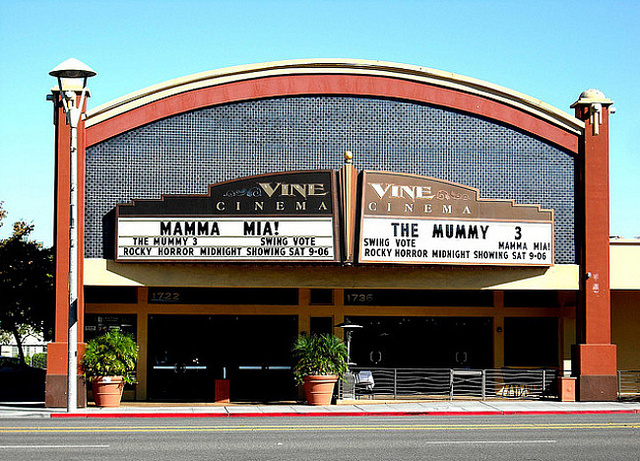 Today, The Vine is a popular downtown cinema where customers can receive a complete night out: a tasty dinner and a first-run movie. Louisville, Kentucky may be best known for thoroughbreds and bourbon, but the city’s impressive majestic old theaters are pretty cool, too. The Louisville Palace (pictured), opened in 1928 as the Loew’s and United Artists State Theater, is a stunning Spanish Baroque-style theater. As unique and majestic as its interior is (we’re talking a grand lobby and an imitation sky on the ceiling), the Palace’s real scene stealer is its ornate stone facade. Just down the street is the Brown Theatre. Part of the historic Brown Hotel, this majestic old theater is a popular performing arts center, and often hosts Louisville’s famous opera company. 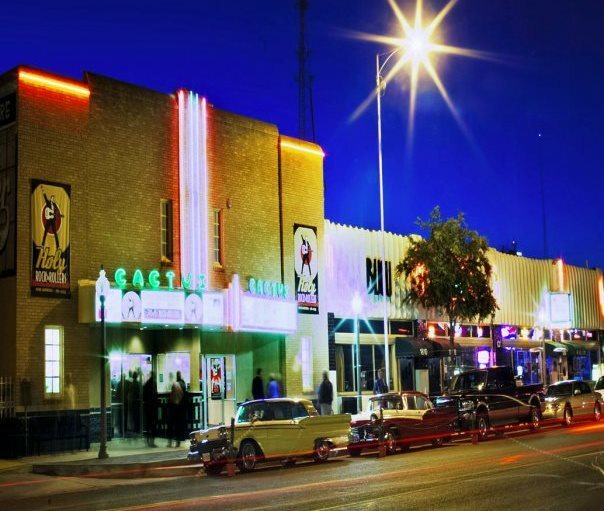 Built in 1938 as a second-run movie theater, the Cactus Theater was Lubbock’s very first suburban neighborhood movie theater. With its neon marquee and cool Art Deco style (not to mention the “washed air” cooling system), the Cactus was a popular hangout spot for Lubbock locals for more than 20 years until it was finally closed in 1957. Fortunately, a group of investors purchased this majestic old theater in the early 1990s, and after extensive renovation, reopened it as the popular cinema and live music venue it remains today. 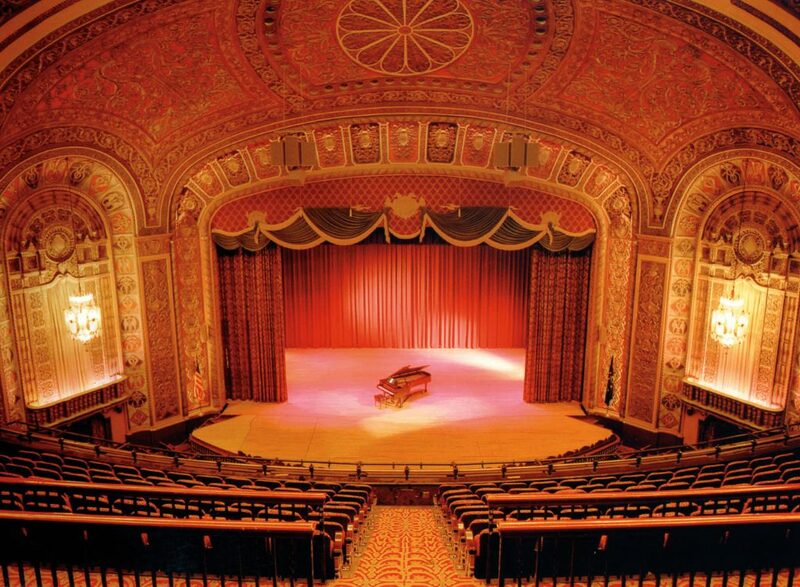 We don’t know what’s more amazing: the history or the architecture of Macon, Georgia’s stunning Grand Opera House. Opened in 1884 as the Academy of Music, the theater was once the largest in the entire Southeast. Some of the best musicals and most famous minstrels and vaudeville acts performed here, and an especially memorable 1908 performance of Ben Hur even included actual live horses with chariots. Though the theater remained a successful movie house into the 1950s, it ultimately fell into disrepair and required the help of the community who fought to save it. Today, the theater, rechristened the Grand Opera House, has been restored to its original magnificence, and is managed by Mercer University. 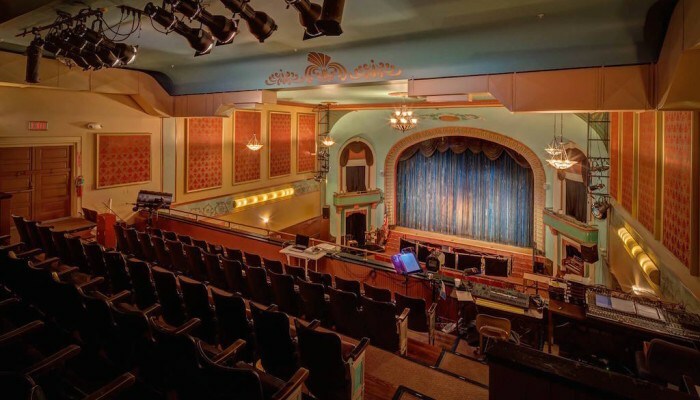 Visiting Mayville, North Dakota’s majestic old theater, the DelChar, is like visiting a movie house or movie palace of days long gone. The DelChar, which originally opened in 1926 as the Bijou Theatre, is only open on Friday, Saturday, and Sunday nights, at which times it plays a single showing at 7:15. Charmingly, the title of the film being shown is still presented on the triangular marquee, while tickets can still be purchased at the glass-box ticket booth. Andrew and Bertha Tainter built the beautiful Mabel Tainter Center in 1889, after their arts-loving daughter passed away tragically at age 19. The majestic theater is Romanesque in style, and a perfect example of the Victorian opulence of the late 19th century. 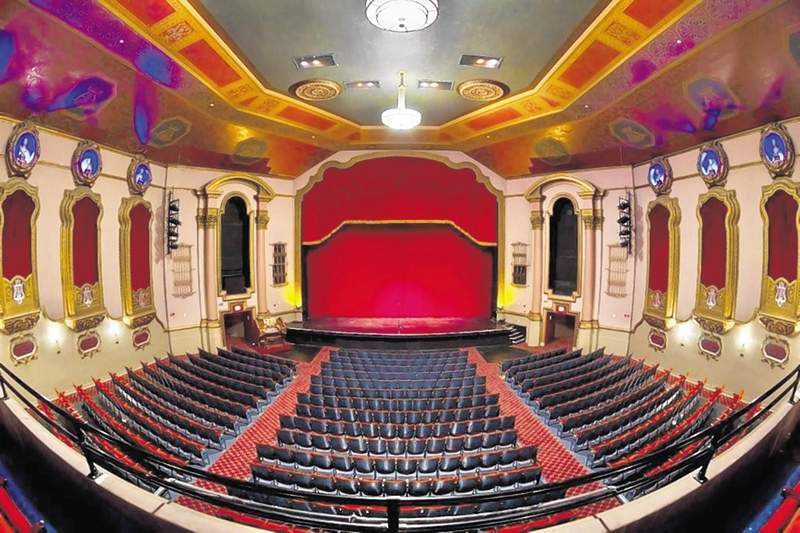 Elaborate Moorish archways, hand-stenciled walls, stained-glass windows, marble staircases, and four fireplaces all contribute to the luxurious majesty of this wonderful old theater, though the centerpiece is arguably the original Steere & Turner tracker pipe organ that has been lovingly restored and maintained over the years. Meridian, Mississippi is home to two majestic old theaters: the Riley Center, which opened in the late 1800s, and the Temple Theater (pictured), constructed during the 1920s. 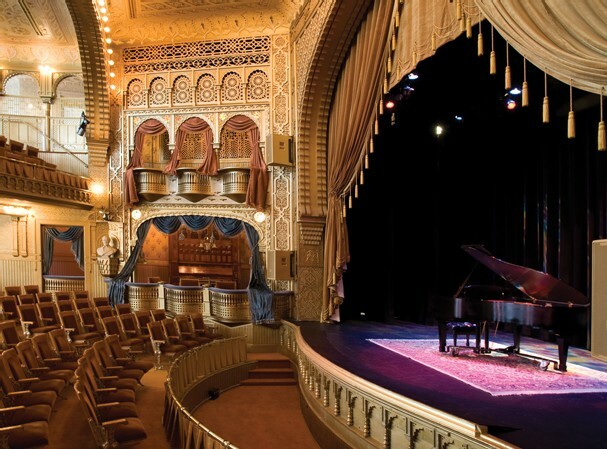 The centerpiece of the latter is undoubtedly the original “3 manual 8 rank” Robert Morton pipe organ, while the Riley boasts such stunning characteristics as preserved woodworking and wainscoting, more than 60 unique wall coverings, and an original lambrequin which hangs above the stage. Cosmo Theatre is a majestic old theater located in the small town of Merrill, Wisconsin. Despite being completely destroyed by fire in 1928, the Cosmo was rebuilt in the Art Deco architecture style, complete with a pink, blue, and white neon marquee. 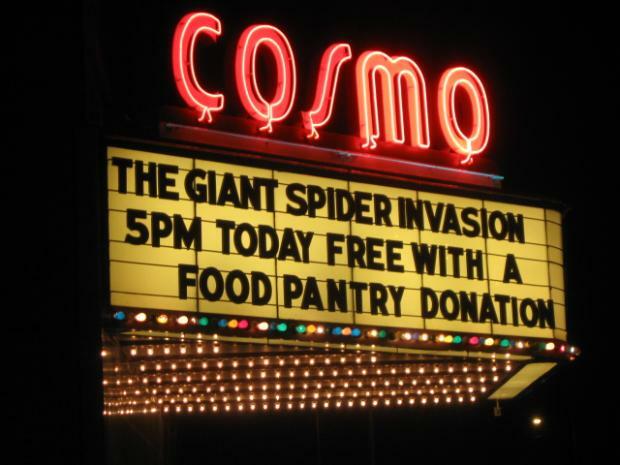 Interestingly, the theater was featured in a 1975 film entitled The Giant Spider Invasion, which was filmed on location in Merrill. Middletown, New York’s Paramount Theatre is such a majestic old theater it has been given a spot on the National Register of Historic Places. Built in 1930 in the Art Deco style, the Paramount was such an anticipated venue that its opening included a celebratory parade! When the U.S. Supreme Court decided that movie studios must divest themselves of their theater chains, the Paramount was sold to a new owner, but sadly closed just five years later. Fortunately, a local arts council purchased the theater, restored it, and has since opened it as a performing arts venue. Minneapolis, Minnesota is home to a number of majestic old theaters, including the State Theatre and Uptown Theatre. Another of Minneapolis’s impressive theaters is the Pantages Theatre (pictured), which opened in 1916 as a vaudeville house to host singers, comedians, and banjo players. 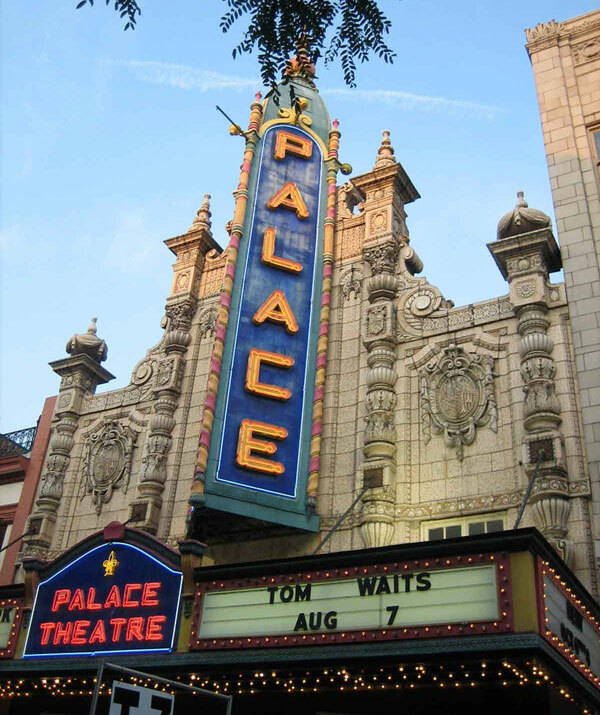 Designed in the Art Moderne and Beaux Arts styles, the Pantages was remodeled as early as 1922, during which time its iconic stained-glass dome was added. Yet another of Minneapolis’s majestic old theaters is the Heights Theatre, which unbelievably, had managed to retain its sense of majesty despite surviving at least three fires, a bombing, and a massive tornado in 1949. 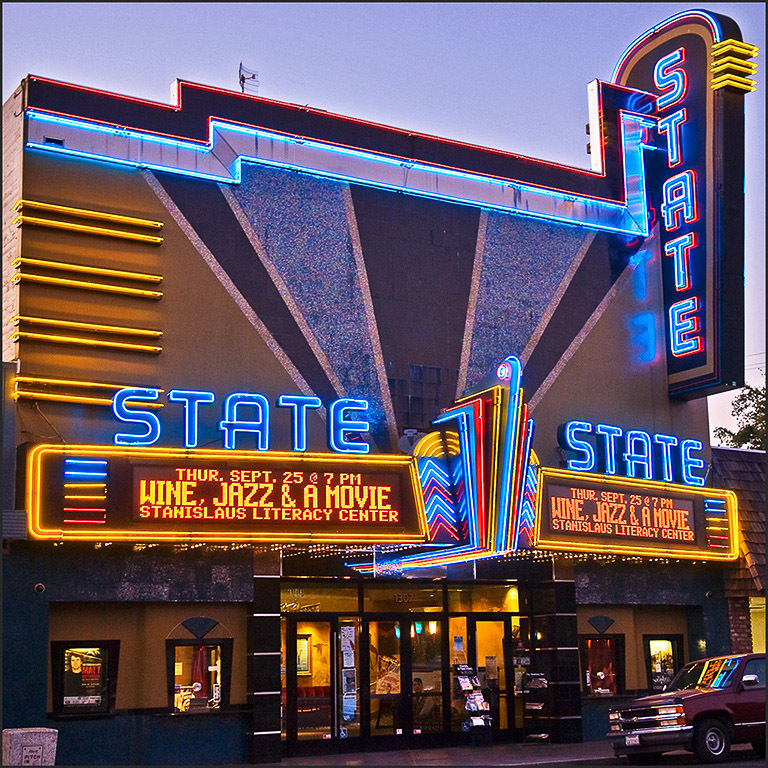 The State Theatre in Modesto, California opened for the first time on Christmas Day in 1934. Designed by well-known theater architect S. Charles Lee, the theater features a number of architectural features traditional to the Art Deco style. 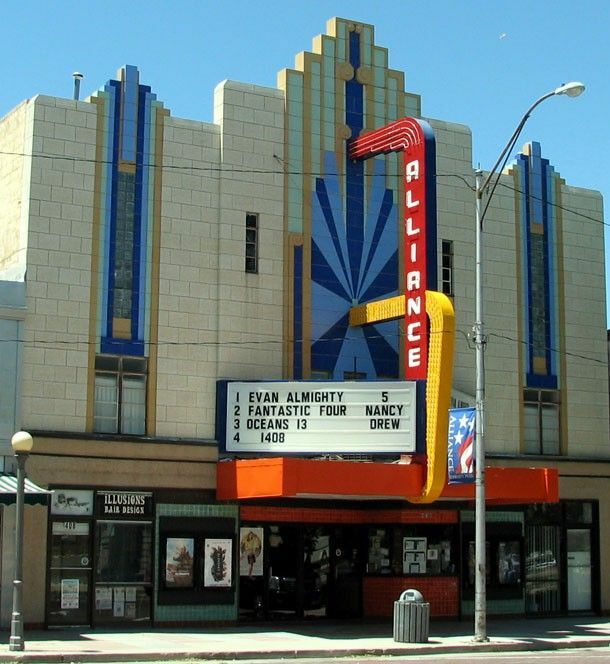 The theater was a popular venue for first-run films for decades, even hosting premieres and other special showings of Star Wars as well as other films by Modesto native George Lucas. In 2006, it was completely remodeled into a performing arts center for the community. 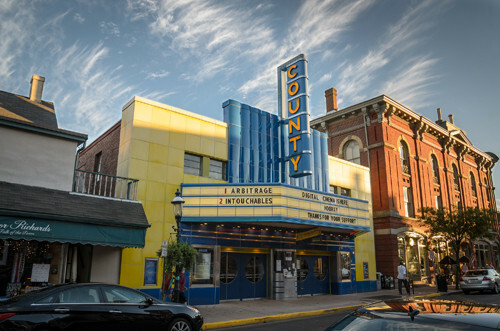 Architecturally speaking, there may be no other theater as unique and diverse as the Goetz Theatre in Monroe, Wisconsin. The Goetz, which opened in 1931, was built mostly in the Atmospheric Spanish Renaissance style, but also given some Art Deco accents. Even more uniquely (though at least more consistent with the styles appearing on other buildings in the Monroe area), the theater also included some Swiss accents, such as the “Swiss style” roof over the front doors and the “Swiss” marquee. The original screen remains intact, though two others have been added over the years. Today, the Goetz Theatre plays first-run films in an all-digital format. 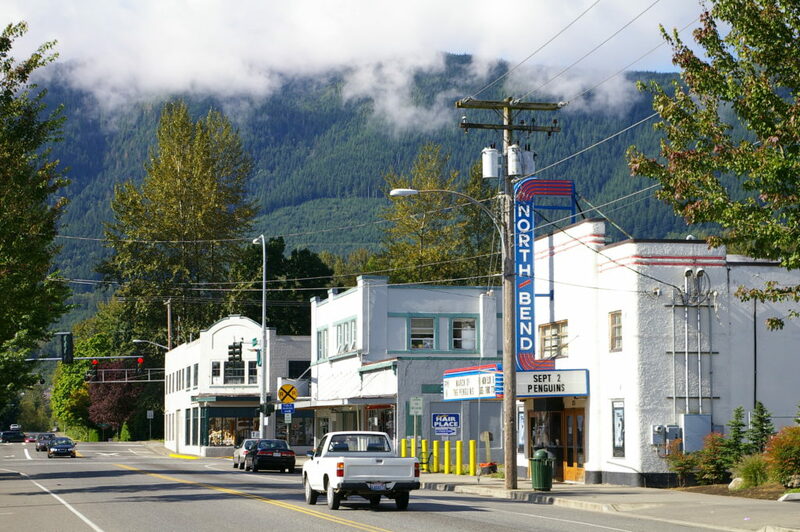 North Bend Theatre in North Bend, Washington, opened as an independent movie palace in April of 1941. For decades, this majestic old theater defied the odds and survived as a popular, successful cinema for the local population. When new owners took over North Bend Theatre in 1999, a massive renovation was done to increase the functionality and comfort of the historic theater. Fortunately, while the screens were lined with new curtains, the lobby was extended, and new heating and cooling systems were installed, the beautiful Art Deco features of the original theater were lovingly restored or left intact. 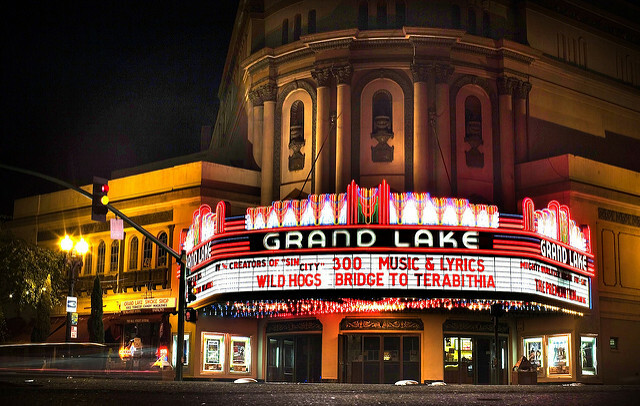 This major Bay Area city is chock-full of buildings with historical significance, not least of which is the Grand Lake Theater (pictured). Opened in 1926 for vaudeville acts and silent movie showings, the Grand Lake began showing exclusively “talkies” a mere two years later, when it also became part of the chain of Fox Theaters. Remnants of Grand Lake Theater’s former glory days are still very apparent today. A crystal chandelier still hangs in the lobby, classic frescoes still adorn the walls of the auditoriums, and the old Mighty Wurlitzer organ is still brought out for special occasions. Another majestic old theater, The Paramount, is also located in Oakland. 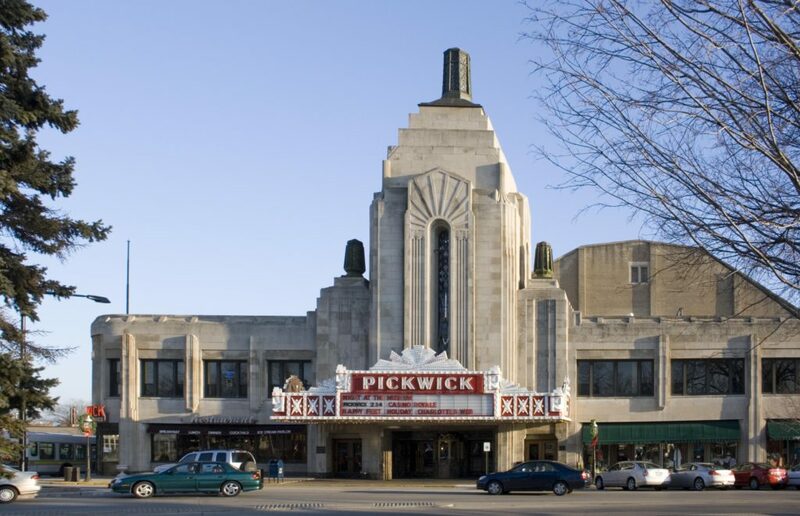 This stunning and majestic old theater, the Pickwick Theatre, is located in the Chicago suburb of Park Ridge, Illinois. Opened in 1928 as a vaudeville stage and movie palace, the Pickwick is most recognizable for its Art Deco exterior, including its colorful marquee and 100-foot tower. Inside, the Art Deco decor continues throughout the lobby and main auditorium, the latter of which is designed to resemble an Aztec or Mayan temple. Three new screens have since been added to the theater, though the Pickwick, which has been named to the National Register of Historic Places, continues to honor its past by hosting both live stage shows and films both old and new. 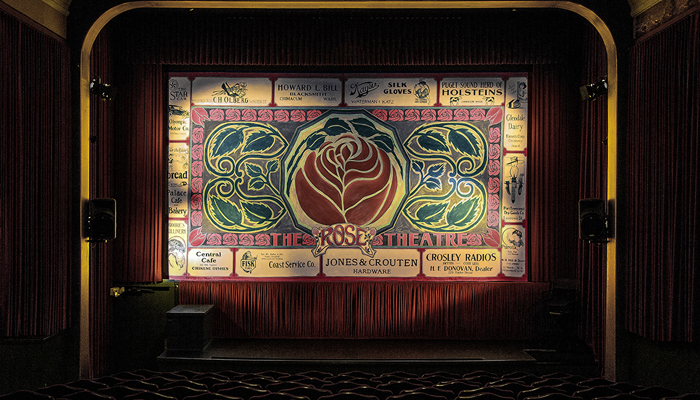 A trip to the Rose Theatre in Port Townsend, Washington is much more of an experience than a simple trip to the movies. The Rose opened in 1907 as a theater for vaudeville acts. Over the years, the Rose has hosted everything from live shows, to silent films, to “talkies” and Technicolor, to the newest digital releases. Every once in awhile, the Rose even presents a ballet, opera, or classical music concert. The theater is named for its largest, original auditorium, but has since added the slightly smaller Rosebud Cinema, and the ages 21+ Starlight Room. Portland, Oregon is home to at least three majestic old theaters. Pictured is the Bagdad Theater, built in 1927 and listed on the National Register of Historic Places. Though it’s been lovingly restored, the Bagdad looks remarkably similar to the way it did when it first opened its doors. Transoms, wrought-iron balconets, decorative molding, and a red-tile roof characterize the exterior, while the theater’s interior is dominated by the stunning main auditorium. The auditorium’s distinct look, designed to look Mediterranean, includes ornate lighting, arched doorways, trompe-l’oeil tiles, and various motifs of animals and mythological characters. Today, the theater is owned by a brewpub chain, and continues to show first-run films. Portland is also home to two other majestic old theaters: the Avalon Theatre and the Academy Theater. The Providence Performing Arts Center is easily one of the most magnificent and majestic old theaters left in the United States, and quite possibly even the world. Its interior, which somehow escaped demolition in the 1960s and 1970s, is chock-full of ornate gilded plasterwork, columns made of imported marble, and dozens of crystal chandeliers. The theater, now listed on the National Register of Historic Places, originally opened in 1928 as Loew’s State movie palace. It showed silent movies accompanied by its $90,000 Robert Morton organ. Though the theater no longer shows movies, the organ still exists, and is used sparingly for special occasions. Named for William Byrd II, the founder of Richmond, Virginia, the magnificent Byrd Theatre has been entertaining the locals since Christmas Eve, 1928. 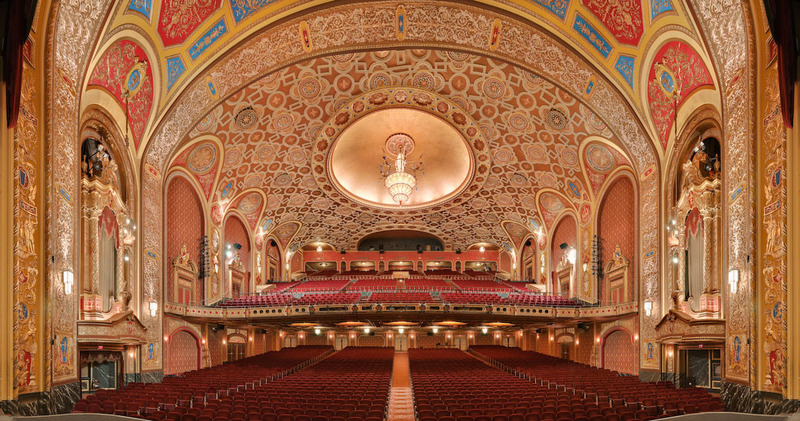 Built in the Renaissance Revival style, the theater’s interior includes balcony and orchestra seating, 11 Czechoslovakian crystal chandeliers, imported Italian and Turkish marble, hand-sewn velvet drapes, and oil-on-canvas murals depicting scenes from Greek mythology. Amazingly, the theater, which is a certified Virginia Historic Landmark and is also listed on the National Register of Historic Places, has not undergone any major repairs or renovations. Besides hosting the annual Richmond French Film Festival, the theater plays second-run movies 365 days a year, plus classic films every Saturday at midnight. 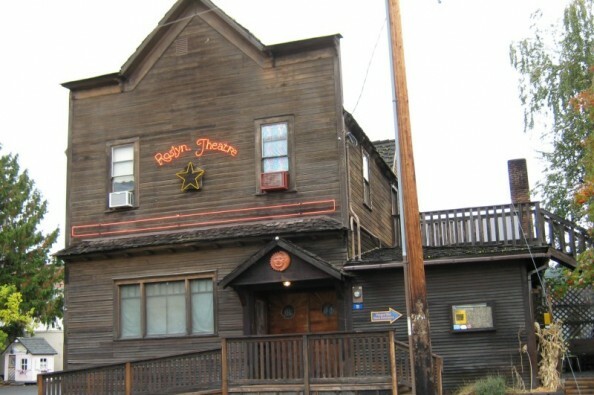 Roslyn, Washington’s Roslyn Theatre may not be majestic in the way that some of these other theaters are, but there is surely no other theater in the world quite like this one, and we think that in itself is pretty majestic. The building, which looks like something out of a Wild West movie, was originally a mortuary. When the business folded, the theater’s current owners bought and converted it into a movie theater for first-run films. Comfort is key at the Rosyln Theatre. Seating capacity tops out at about 100, though the number of love seats available is fewer. Even better, patrons are invited to bring their dogs! 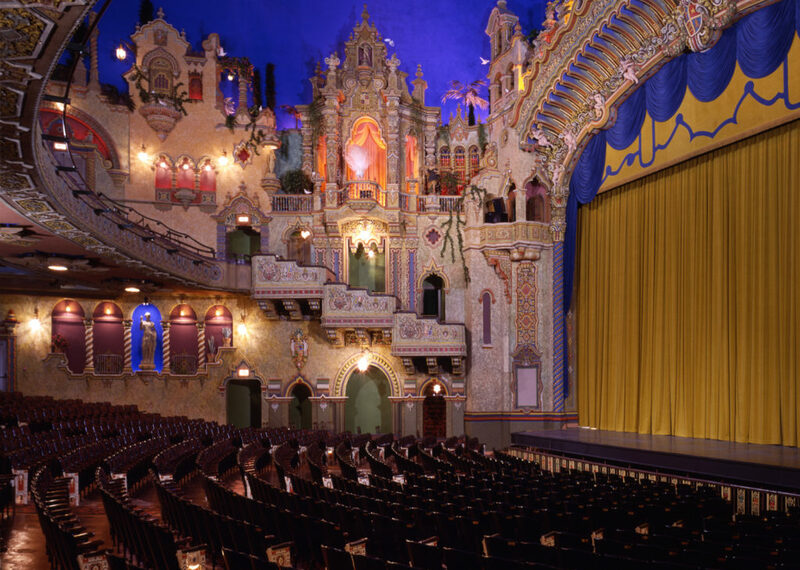 San Antonio, Texas is home to two majestic theaters, though the most impressive is undoubtedly the aptly named Majestic Theatre. 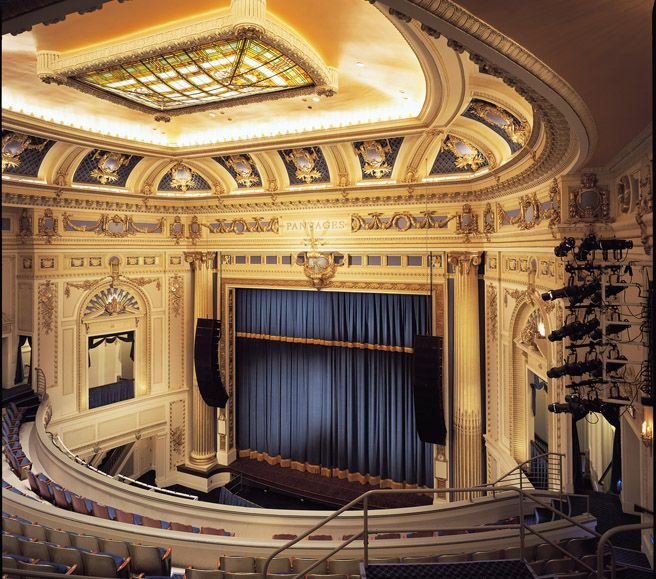 Built in 1929, the Majestic currently plays host to the San Antonio Symphony. Its impressive architecture is a fantastical mix between Spanish Mission, Baroque, and Mediterranean styles, and characteristic features include tile roofs and arches, handcrafted plaster moldings, impressive balconies, and a one-of-a-kind blue ceiling onto which moving clouds can be projected. 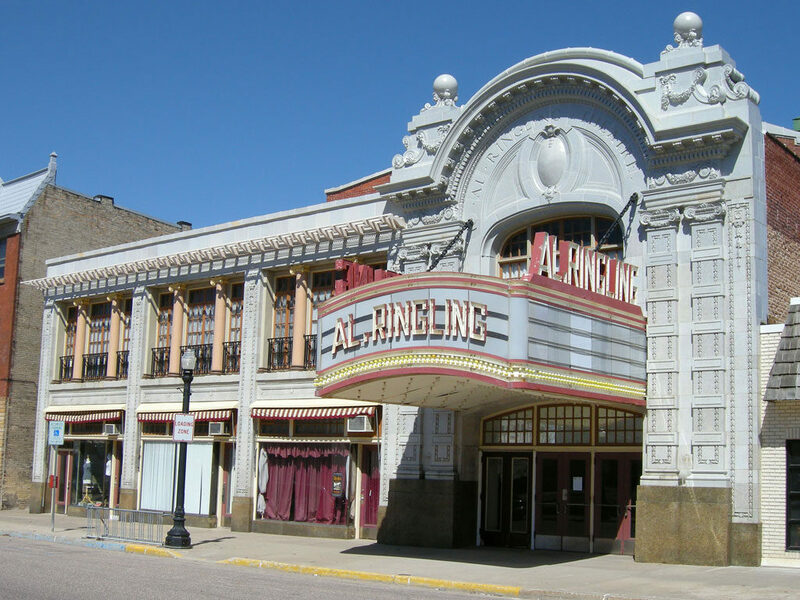 Amazingly, the Main Street Theatre in Sauk Centre, Minnesota has had only two owners since its opening in 1939. Perhaps that’s why Main Street Theatre seems just as majestic today! 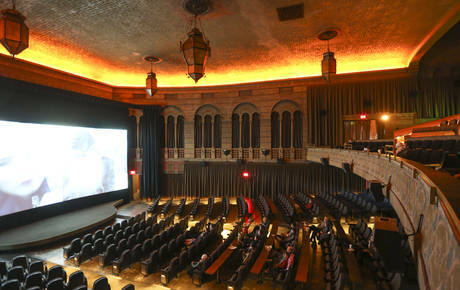 The theater has been lovingly restored over the years to retain its original Art Deco style. While the three screens inside remain charming and cozy, the crown jewel of Main Street Theatre is its facade. The large rounded marquee is a common feature of Art Deco movie palaces, though the vertical spelling of the word “Street” tends to be a more unique feature. When Scottsbluff, Nebraska’s Egyptian Theater completely burned down in 1945, it was replaced in less than a year by the Midwest Theater. Uniquely, the Midwest Theater is characterized by its Modernistic architecture style, as it was built after the days of grand Art Deco theaters. Its 60-foot high stainless steel and aluminum marquee, each side of which is flanked by glazed masonry panels, is arguably the theater’s most striking feature, while inside, three-dimensional plaster floral scrolls add a touch of majesty to both sides of the screen. 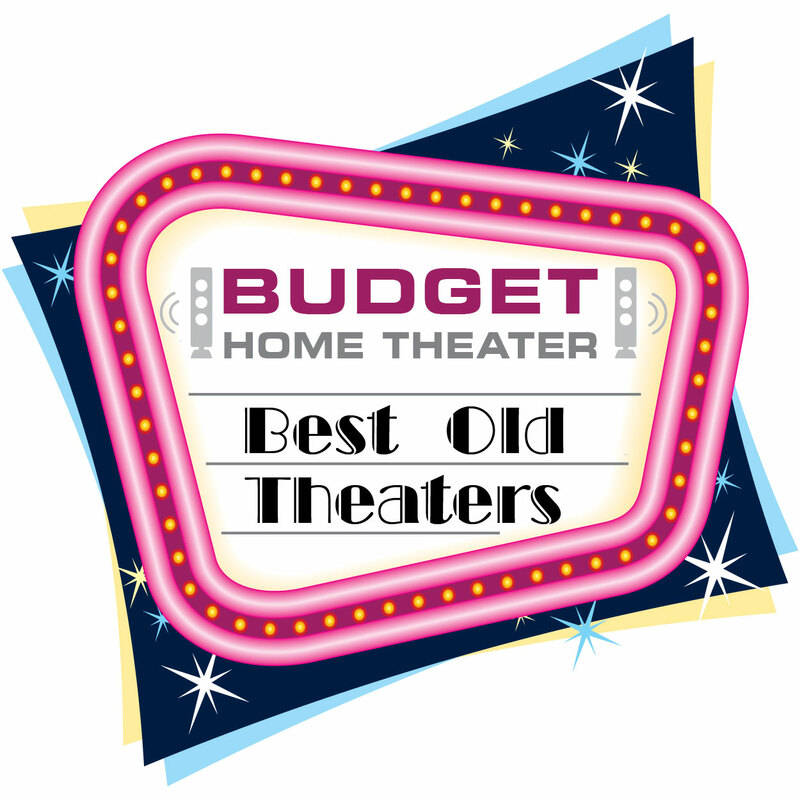 Amazingly, only minor cosmetic changes have been made to the theater throughout its history. 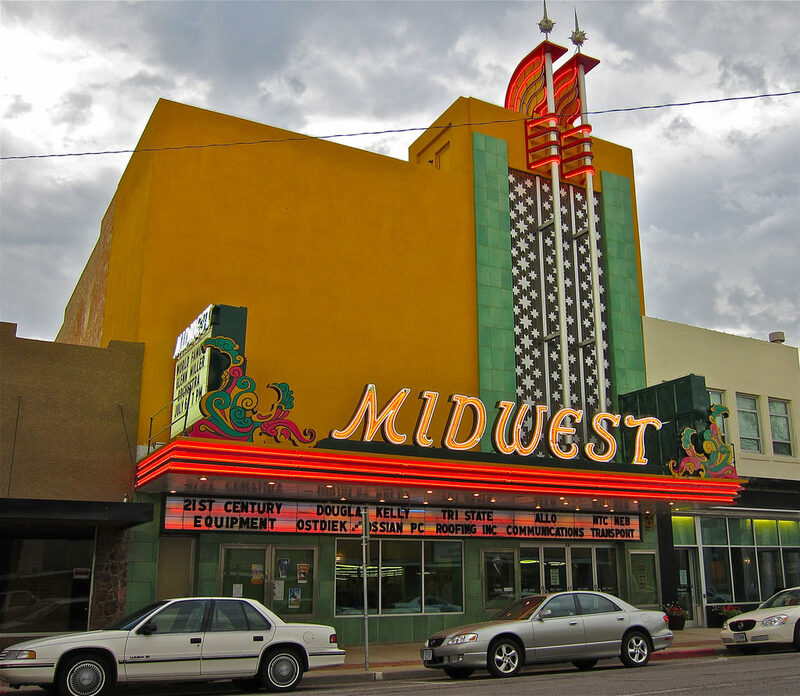 Today, second-run and classic films are shown at the Midwest, which was included on the National Register of Historic Places in 1997. One of the oldest majestic historic theaters on our list is the Hi-Pointe Theatre, located in St. Louis, Missouri. The Hi-Pointe, which opened in 1922, was initially used as a single-screen theater for first-run films. Over the years, the theater’s ownership has changed from the St. Louis Amusement Co., to the Arthur Brothers Chain, Landmark Theaters, and most recently, independent operators. In 2015, the Hi-Pointe installed an additional screen and 50 more seats. Today, it is used for a mix of first-run and art house films. While many of the majestic old theaters on this list were built as grand movie palaces, St. Paul’s Grandview Theater is something of the opposite. 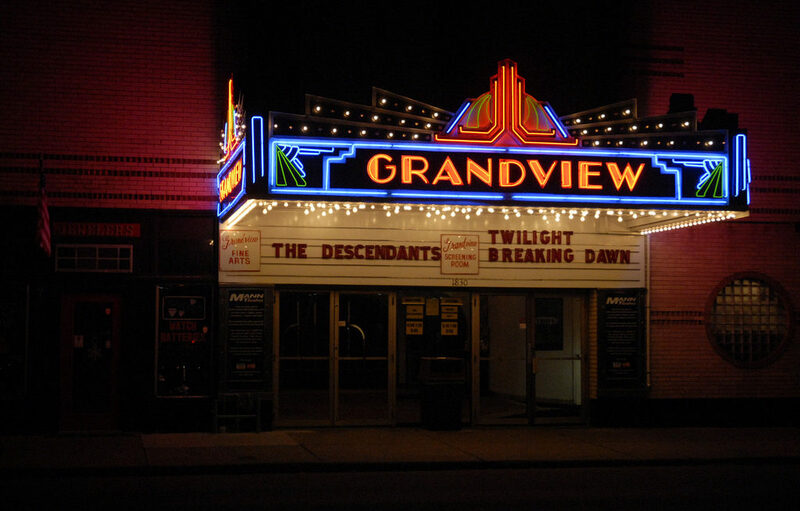 In fact, the Grandview was opened in 1933 as a small neighborhood theater. Still, there’s undoubtedly something majestic in this old-fashioned movie house. 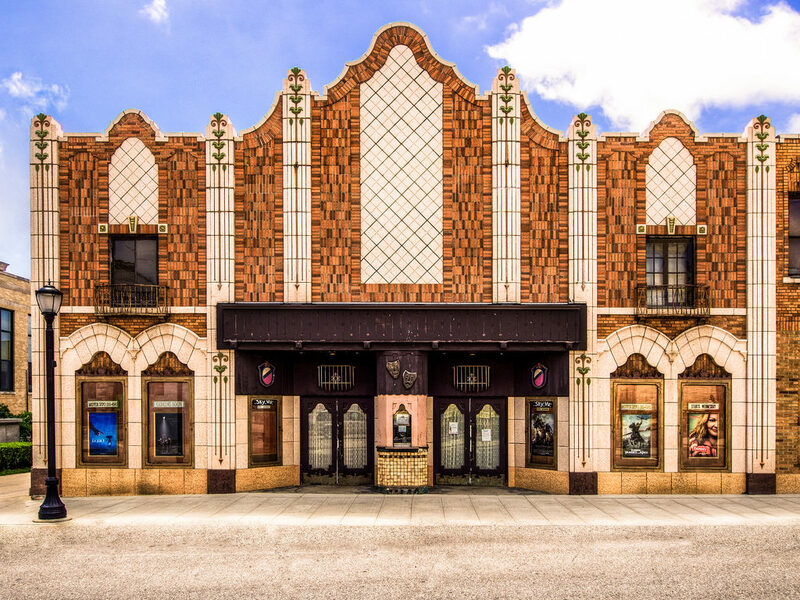 Built in the Art Moderne style by architect Myrtus A. Wright, the Grandview’s ornate facade includes a black-and-white neon marquee and two vitrolite columns. Inside, what was once a big auditorium has been separated into two smaller theaters, though much of the Grandview’s interior retains the original Art Moderne look. Unfortunately, Stevens Point, Wisconsin’s Fox Theater remains closed despite its addition to the National Register of Historic Places and despite efforts to revitalize it. 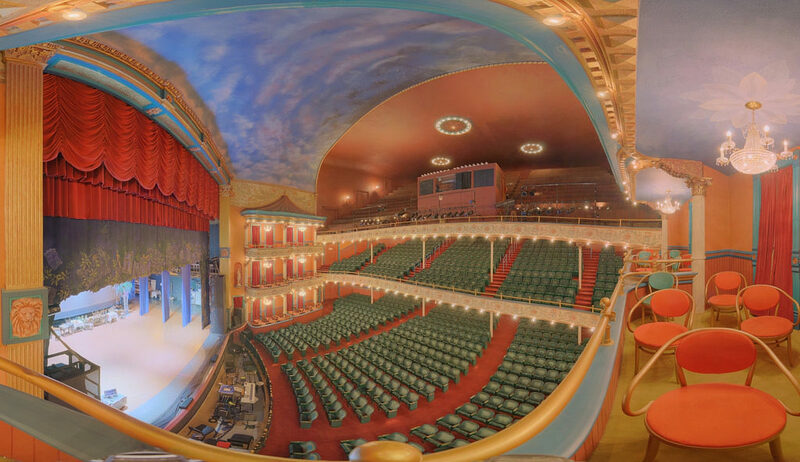 Still, we’re sure that any theater that once hosted Harry Houdini deserves a spot on our list of majestic old theaters. Originally built as the Grand Opera House in the early 1890s, the theater began as a popular venue for vaudeville and stage shows. In the 1920s, it became the Fox Theater and remained a popular movie house for the next 60 years until it was closed in 1985. Here’s hoping one of the many groups who have tried to find a use for this beautiful old theater will soon be successful. Originally opened as the Rita Theatre in September of 1940, this majestic theater in Taylor, Texas was actually the second-run theater in town. The town’s first-run theater was across the street, called Howard Theatre. In the 1950s, the original Howard Theater was sold, the sign was moved over the Rita, and this “new” Howard Theatre was opened to the public. If its history is a bit confusing, its sense of majesty shouldn’t be. 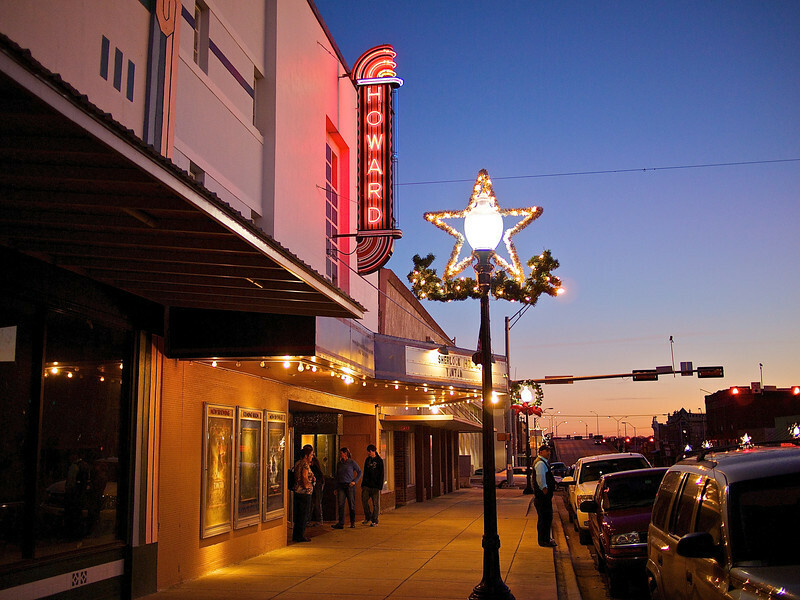 Today, the Howard still entertains the residents of Taylor, Texas with first-run, digital films. 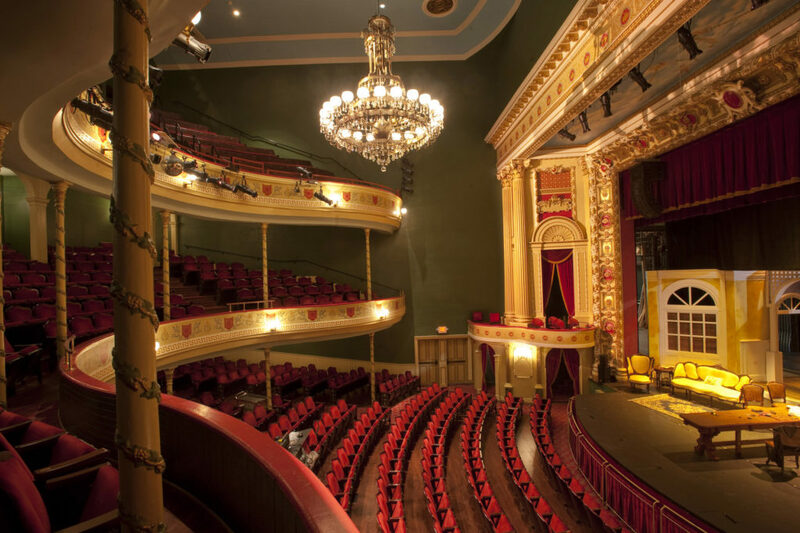 Wilmington’s beautiful Thalian Hall is one of the oldest continuously operating theaters in the United States. Opened in 1858, this national treasure is now the only remaining building designed by John Montague Trimble, perhaps the most famous theater architect of the 19th century. The Hall was originally purposed to house the town government offices and a library in addition to a 1,000-seat auditorium, but during a vast 1909 renovation — during which electric stage lights were also installed — the stage and auditorium were expanded to give this majestic theater a single purpose.